Self-help authors rarely distinguish between anger and rage, but Ruth King has devoted her career to exploring the subtle varieties of this emotion. In Healing Rage, she gives all readers access to her pioneering, breakthrough program, which has already changed thousands of lives through workshops nationwide. 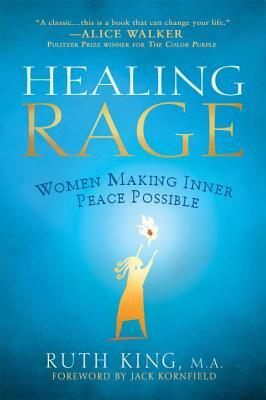 Written for every woman?from counselors and their patients to those who may not realize that rage is at the root of their unhappiness and have just begun to seek new paths of hope?Healing Rage is a unique invitation for transformation. Ruth King, MA, is president of Bridges, Branches & Braids, an organization devoted to working with negative emotions in positive ways, notably the Celebration of Rage and Generational Healing retreats, and the audio CD Soothing the Inner Flames of Rage—Meditations that Educate the Heart & Transform the Mind. A respected authority on the topic of rage, she is also a life coach and team-development specialist. Her client list includes Kaiser Permanente, Intel Corporation, and Levi Strauss & Company. King works extensively with managers, counselors, consultants, psychotherapists, educators, trauma workers, practitioners of the healing and expressive arts, spiritual counselors, artists, activists, mothers, and other women and men who influence the lives of others, to transform the emotional body and mind. King works internationally and lives in Berkeley, California. Her website is www.HealingRage.com.